Pre-game Ep1: "It Smells Like Success" Ep2: "One of Us..."
During the marooning, Ron finds an envelope labeled "Secret Advantage." After getting to camp, he opens it, and follows the directions to the actual advantage (near the water well). 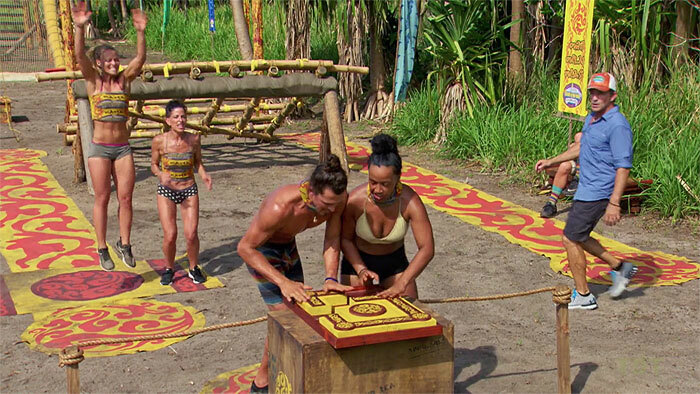 It's a three-episode advantage "menu": Could be a (1) reward steal, (2) extra vote, or (3) hidden immunity idol, and it expires after the third Tribal Council. 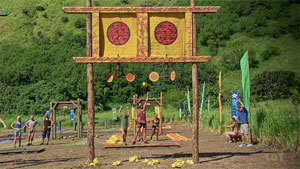 The entire tribe must maneuver through a rope obstacle, then one person (Joe, Chris) must climb a rope and ring a bell. Then as many people as possible must cross a 3-tier balance beam, and untie a bar that releases an easier-to-cross beam for the rest of the tribe. Kelley injures her forehead during the balance beam. 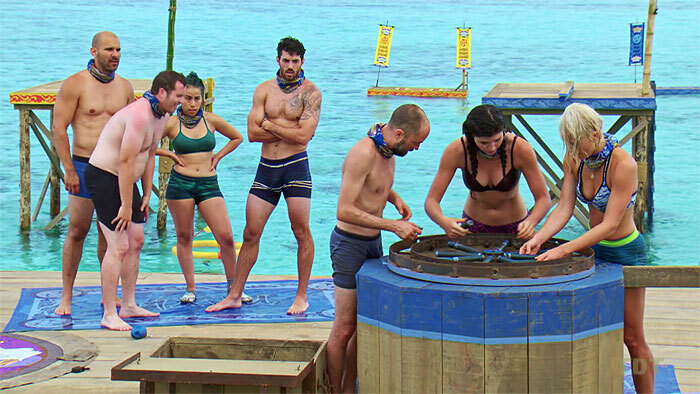 One person (Eric, Lauren) then climbs a crow's nest, pulls a lever to drop a slide, then six players (all but Ron, Julia, Victoria; all but Wendy, Reem, Rick) work together to solve a giant slide puzzle (as first seen in South Pacific). Results: Kama wins, after taking a huge lead on the balance beam. Ep1 IC: "Social Network" - Kama wins. TC1 - Reem voted out (4-3-1-1), sent to EoE, 17 left. While the entire Manu tribe is off on an officially sanctioned idol hunt, Lauren finds a tree that has been knocked down. Placed within the trunk is a blue package, which contains the Manu idol. Lauren buries it elsewhere, doesn't tell anyone about it. Ep2: "One of Us Is Going to Win the War" Ep3: "Betrayals Are Going to Get Exposed" Ep4: "I Need a Dance Partner"
Julie sits out. 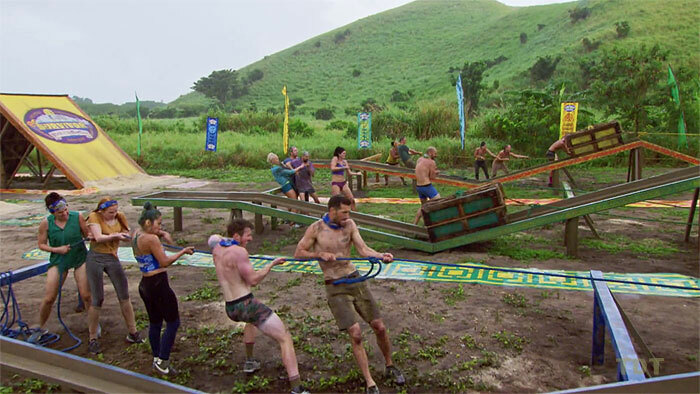 Challenge: As (mostly) seen in Game Changers. Eight people must jump off a dock and swim in to cage, untie a giant 400-lb snake, lift it over the cage, carry it to the beach, then under a crawl obstacle, and finally, lift the snake onto a table. There, they untie knots and remove six number tiles from the snake. Number tiles are used to solve a combo lock (Ron, David). This releases eight rings, and someone (Joe, Eric; Chris, Keith) must toss the rings to land them, flip canoe paddles and spell IMMUNITY. Kama takes a huge lead on the swimming/snake portion, but by the ring toss, Chris catches them up at 1-1. But Keith misses his tosses, and Kama wins, 8-4 (with Joe, Eric, and Chris each flipping four paddles). Kama selects fishing gear for their reward, over spices and a knife set. Ep2 RC/IC: "Serpent Turf" - Kama wins. TC2 - Keith voted out (6-1-1), sent to EoE, 16 left. Ron, Aubry sit out. As seen in the South Pacific Ep6 IC. 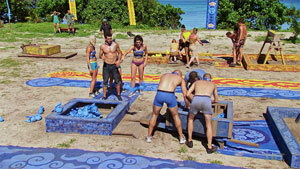 Three contestants (Eric, Julie, Joe; David, Rick, Wardog) must assemble a wheelbarrow, then move it through a series of obstacles, collecting sandbags. Then they dump out the sandbags, and four more people (Gavin, Julia, Aurora, Victoria; Wendy, Kelley, Lauren, Chris) disassemble the wheelbarrow, and use the pieces to build a giant slingshot. Then they (Gavin, Julia; Chris) use that to knock down 4 targets. Shooting results: Chris-4, Julia-1, Gavin-0. Manu wins! Chooses chickens over comfort items. 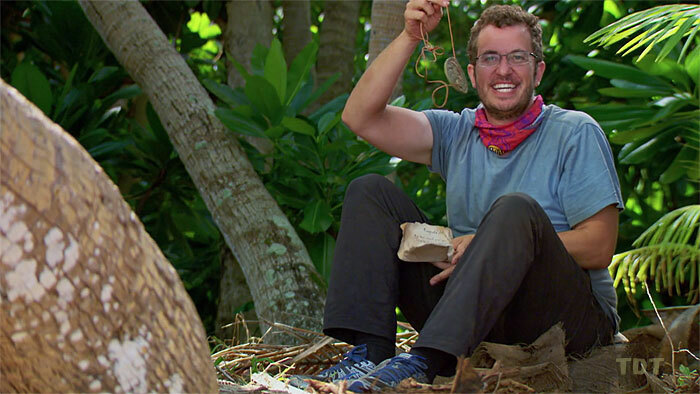 Ep3 RC: "Losing Face" - Manu wins chickens. 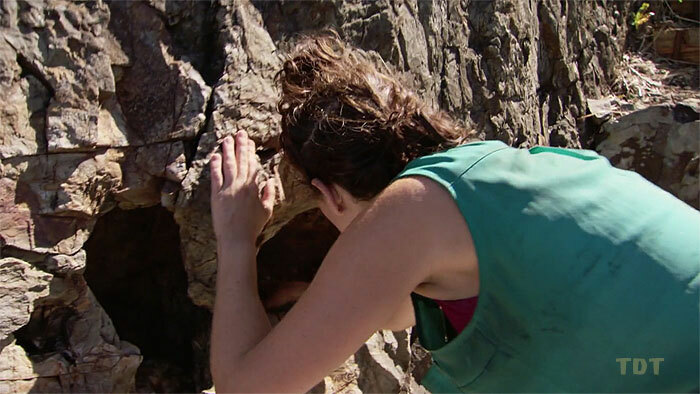 Feeling like she needs the protection, and also wanting to check "find an idol" off of her Survivor bucket list, Aubry resumes searching for idols, and eventually finds one in a tree near camp. T.ears. Julie, Victoria sit out. 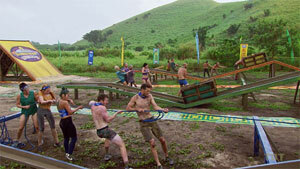 Three tribe members (Gavin, Julia, Aubry; David, Kelley, Lauren) are in a boat, the other four are tethered to it, and will swim to pull it through the water. First to a tower where the three jump off, grabbing keys, then to a platform, where the keys unlock puzzle bags. 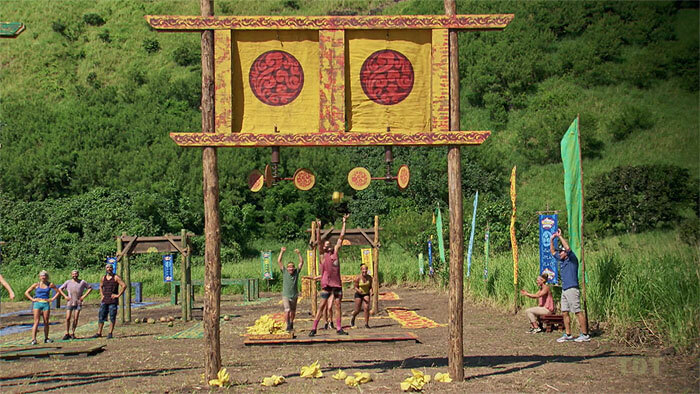 The three then do a three-part ship's wheel puzzle (as lastseen in Game Changers) to raise a tribe flag. Kama lags on the final key, but comes back and beats Manu on the puzzle. Ep3 IC: "Beyond the Wheel" - Kama wins. TC3 - Chris voted out (5-2), sent to EoE, 15 left. After giving Kama time to gasp at Chris's boot, Probst tells everyone to drop their buffs. Three new tribes are formed: Kama (all original Kamas), Manu (all original Kamas plus Wendy), and a third tribe, Lesu (the remaining original Manus). Tribal swap: Three new tribes of 5. As seen in Cambodia. Tribes must cross three (slippery) A-frame barriers, carrying rope, then tie those ropes together, and use the rope to haul a heavy crate along a bumpy track. Once the crate has been hauled, they untie knots to open the crates, then untie puzzle slats. 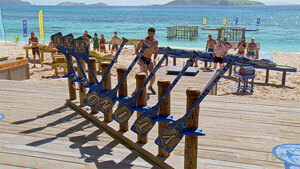 Then two people (Joe, Ron; Kelley, David; Eric, Aubry/Wendy) use the slats to solve a vertical puzzle. Kama solves the puzzle first. Manu second. Lesu loses. Ep4 IC: "Yank Yer Hank" - Kama wins, Manu 2nd. TC4 - Rick voted out (3-2), sent to EoE, 14 left. Ep5: "...Worst Cocktail Party Ever (Pt.1)" Ep6: "It's Like the Worst Cocktail Party Ever (Pt. 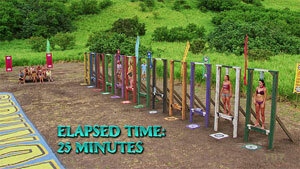 2)" Ep7: "There's Always a Twist"
Julia, Aubry sit out. 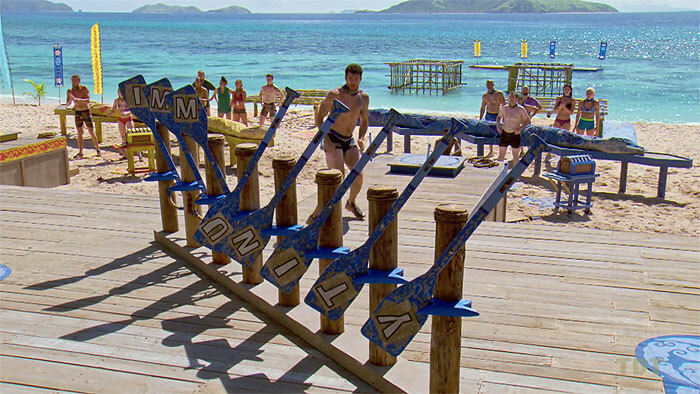 Contestants must race through a series of obstacles (ropes, crawl), collecting four bolos along the way. Then each person must land one bolo on a frame. Winner gets PB&J feast, second place gets a plate. Results: Gavin (Manu-1), Eric (Manu-2), Ron (Kama-1), Joe (Kama-2), Wendy (Manu-3), Aurora (Kama-3), Julie (Kama wins! ), Kelley (Lesu-1), Wardog (Lesu-2), Victoria (Manu-4). Kama first, Manu second. Ep5 RC: "True Grit" - Kama wins PB&J, Manu 2nd. Chris finds a crate buried in the sand. Inside, there are four maps, one for each Extinction resident. 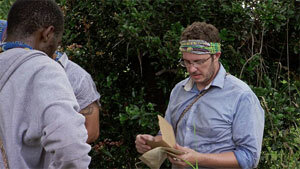 Rick figures out that the maps fold in to reveal the (top of the island) locations of two trees, each with an advantage. After Keith sneaks off while everyone's eating, the remaining three race to catch him. Chris tackles Keith right as he's reaching the tree, and grabs the advantage tube: it contains bamboo, string, and message saying "Practice." Meanwhile, Rick heads to the other tree, and finds its advantage: An extra vote they can give to one person at the next Tribal Council. Aubry receives it later in the episode. 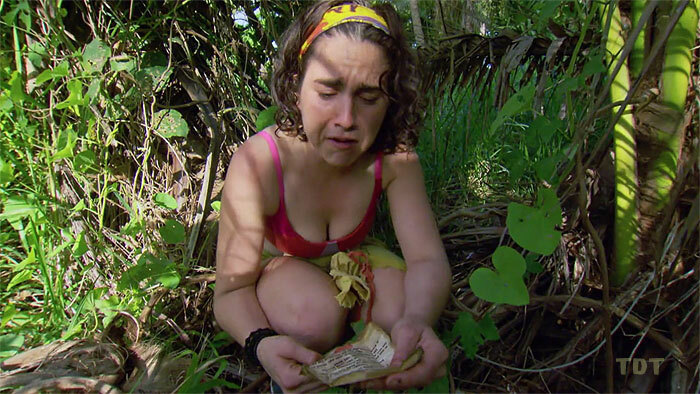 Rick finds extra vote, gives to Aubry. Julie, Victoria sit out. 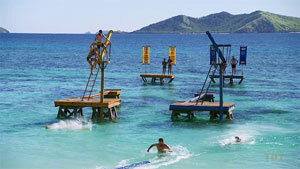 Contestants must swim out, climb up a ramp, dive off and retrieve two buoy puzzle pieces, and take it to a pontoon. 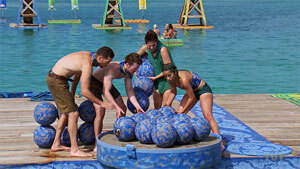 Eric, Gavin (Manu), Joe, Julie (Kama) get their pieces, and pull themselves to a dock to build a four-piece pyramid puzzle. Lesu fails to get buoys while both other tribes are working on puzzle. Eventually Wardog and Lauren them. Kama wins, and Lesu makes a surprise comeback, and places second. Ep5 IC: "A Bit Dinghy" - Kama wins, Lesu 2nd. TC5 - Aubry voted out (4-1), sent to EoE, 13 left. Aurora sits out. 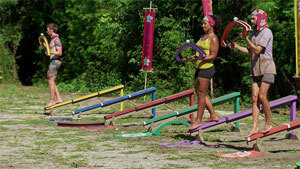 Contestants must cross tables, then one person (Lauren, Julia, Victoria) unties knots to release a lever, dumping sandbags. Everyone must then transfer sandbags to a collecting basket. 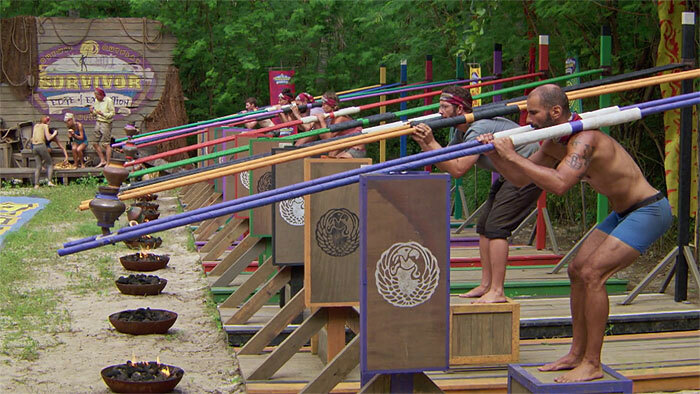 Then one person (Joe, Gavin, Wardog/Lauren) tosses sandbags at a spinning wheel to lower flags (as in Ghost island). Scoring: Joe-1, Gavin-1, Joe-2. Kama wins pastry feast. Gavin-2 Manu second, gets cookies and iced coffee. Lesu loses again. Ron sits out. 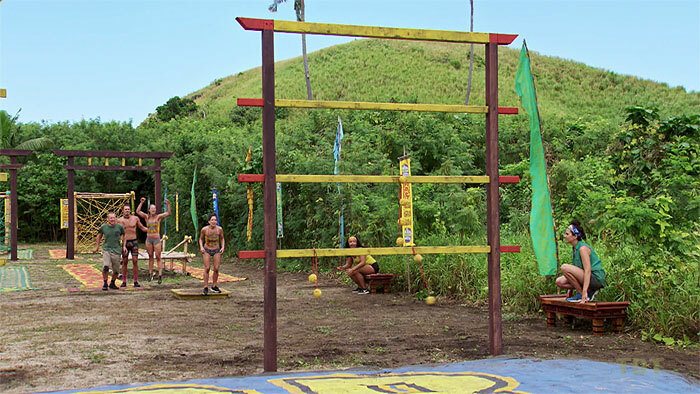 Contestants must climb a ladder and maneuver a bag attached to a rope through a bamboo frame. They then toss a ball inside the bag (on a string) through a hoop, and use it to pull down a frame, which they cross, then two people (David, Kelley; Eric, Victoria; Julia, Julie/Joe) work a table maze. Joe swaps in, solves the table maze for Kama, and Kama wins! Last two teams (Lesu, Manu) have to attend Tribal together. Ep6 IC: "In Through the Out Door" - Kama wins. In the lead-up to their joint Tribal Council with Manu, Lesu realizes Wardog has disappeared, and (rightly) conclude he's off looking for idols. So Kelley, David, and Lauren all search themselves. Kelley eventually spots it, in a tree right behind Wardog. He wanders off and she grabs it. She later tells Lauren she found it, and Lauren responds that she has the Manu one, too. TC6 - Wendy voted out (4-4 [6-0]), sent to EoE, 12 left. 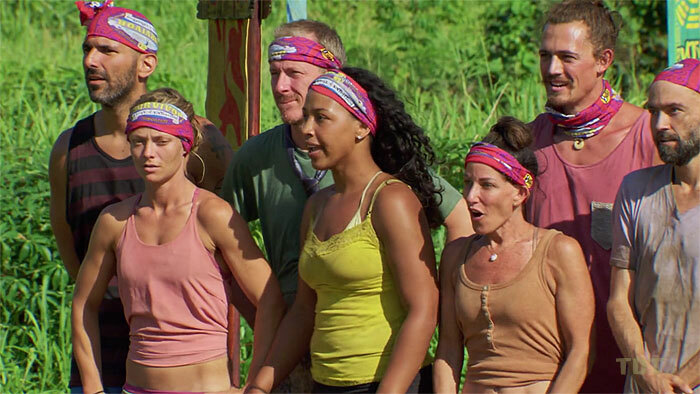 The three tribes come together at a challenge site, and ... surprise! It's a merge instead. Oh yeah, and then the booted players from Edge of Extinction all come in, too. After numerous gasps, Probst explains how Edge of Extinction works, and that the bootees are here for a chance to re-enter the game. 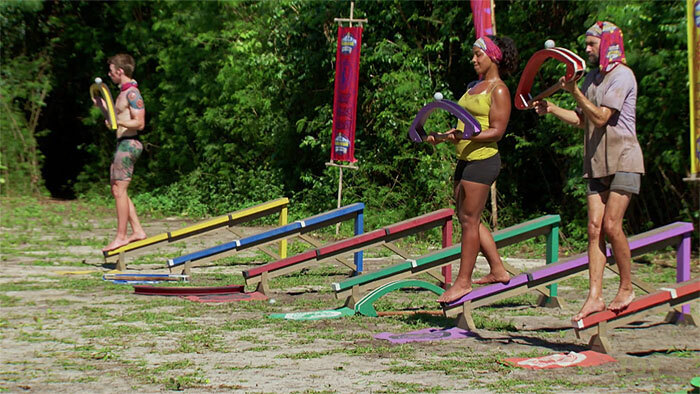 Re-entry challenge, featuring the six people voted out thus far: Reem, Keith, Chris, Rick, Aubry, and Wendy. Contestants must climb over a cargo net and untie a bag of sticks. Then tie the sticks together, retrieve a key to unlock a gate (as in "Jail Break"). Then maneuver a ball along the vertical snake track from DvsG. Aubry is first to the snake maze, then Rick, Reem, Wendy, Chris, Keith. Wendy makes slow, steady progress, Rick, Chris just behind her. Wendy drops at the very top. Chris does too. Rick wins! Rick re-enters the game, joining the new merged Vata tribe. After they leave, the others learn they can go back to Extinction if they want to. All do. Ep7 RC: "Back in the Saddle" - Rick wins, re-enters game, 13 left. After returning to Edge of Extinction, Wendy and Keith each decide they've gotten as much out of the experience as they're likely to, and raise the sail. They leave in a boat. Later, the three remaining inhabitants (Reem, Chris, Aubry) show up at Tribal as the jury. Apparently concerned that Rick could be voted right back out, production just puts an idol in his bag. Except it doesn't stop him from being voted right back out, because it has to be split in half and shared with someone else (he picks David), and then it only becomes fully powered if both are still there during the Ep8 Tribal Council. Yay? Rick finds idol in his bag. Ep7: "... Always a Twist" Ep8: "I'm the Puppet Master" Ep9: "Y'all Making Me Crazy" Ep10: "Blood of a Blindside"
As last seen in Ghost Island. Contestants must stand on a narrow beam, holding a long pole over their head, with a statue balanced on one end. If it drops, they're out. In regular intervals, they move up the beam to a narrower perch. Transitions are live as they move up. Order of elimination: Stage 1 (5 min) 13. Ron, 12. Gavin, Stage 2 (5 min): 11. Wardog (on transition), 10. Rick, 9. Victoria, 8. Aurora. Stage 3 (10 min): 7. Kelley. Stage 4 (unlimited): 6. Eric (on transition), 5. Julia (also), 4. David (on transition), 3. Joe (40 min. ), 2. Lauren, 1. Julie wins! Ep7 IC: "Audio Slave" - Julie wins. TC7 - Joe voted out (6-3-2-2), sent to EoE, 12 left. Two teams, randomly drawn: Blue (Eric/Wardog, Rick/Aurora; Victoria, Julia) and Yellow (Gavin/Kelley, Julie/Lauren; David, Ron). 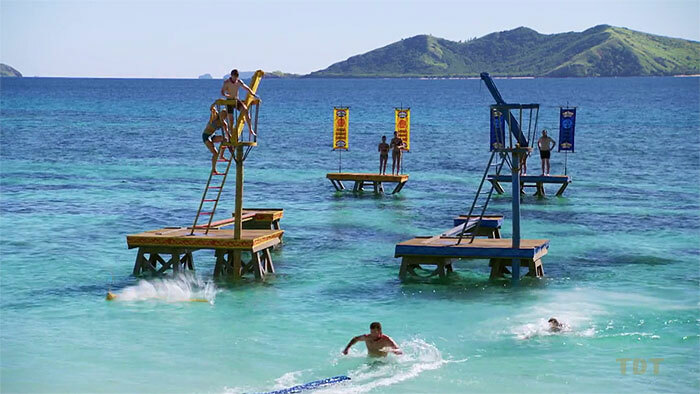 First four contestants, in pairs, must dive in, swim to a balance beam, cross it, climb a crow's nest, toss a bag of puzzle planks in the water, then jump in and swim it to shore. 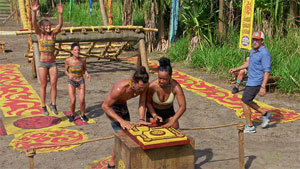 Final two people (Victoria, Julia; David, Ron) use the planks to solve a puzzle. Winner gets Chinese takeout back in camp. Blue team takes an early lead on getting the planks, wins. Ep8 RC: "Planks a Lot" - Blue team wins Chinese food. The Edge of Extinction residents are given wine bottles with an advantage clue inside. 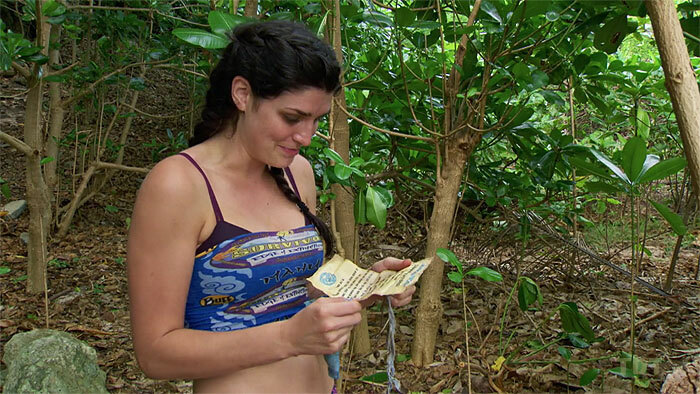 It directs them to the stairs, where Aubry finds a key and message. 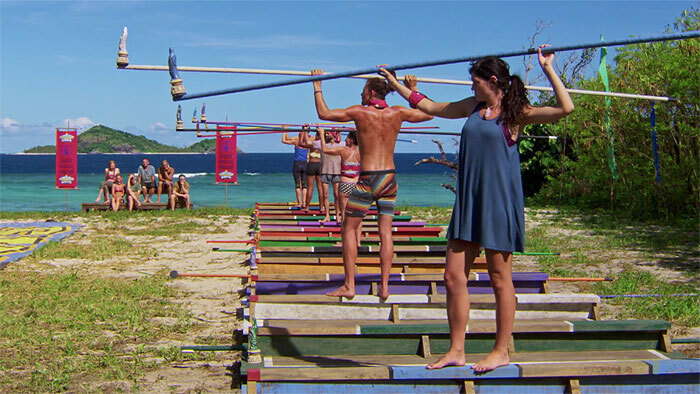 The key unlocks two advantages at the end of the beach: An extra vote that she has to give to someone in the game (Aurora), and a challenge practice advantage, for Rope-a-Dope. As originally seen in Worlds Apart. 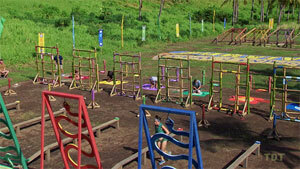 Contestants must balance on their toes, with a block of wood wedged between their head and the surrounding frame, until it drops. Order of elimination: 12. Wardog, 11. Eric, 10. Gavin, 9. Kelley, 8. Rick, 7. Julia, 6. Ron, 5. Julie… [25 minutes] 4. David, 3. Lauren passes out... and recovers, 2. Victoria, 1. Aurora wins. Ep8 IC: "Keep on Your Toes" - Aurora wins. TC8 - Eric voted out (8-2-2), sent to EoE, 11 left. As originally seen in South Pacific. 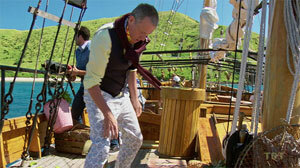 Contestants must stand on a narrow perch, balancing a ball on a bow, until they drop. After a period of time (5 minutes?) they move up to a narrower part of the beam. Order of elimination: All survive Stage 1. Stage 2: 11. Wardog, 10. Julie. Stage 3: 9. Ron, 8. Rick, 7. Aurora, 6. Victoria, 5. Lauren, 4. Kelley, 3. Julia, 2. David, 1. Gavin wins! 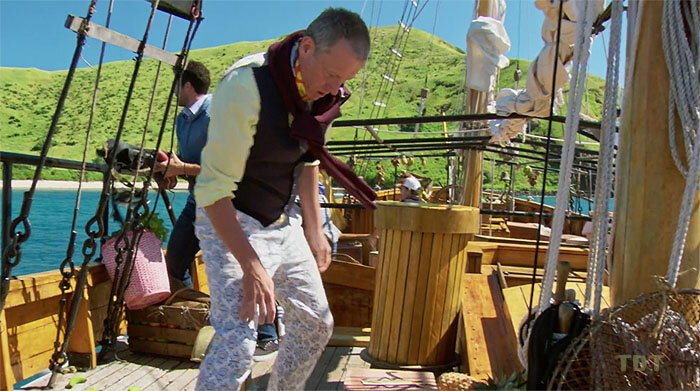 Ep9 IC: "Bow-Diddley" - Gavin wins. As originally seen in Heroes v. Healers v. Hustlers. 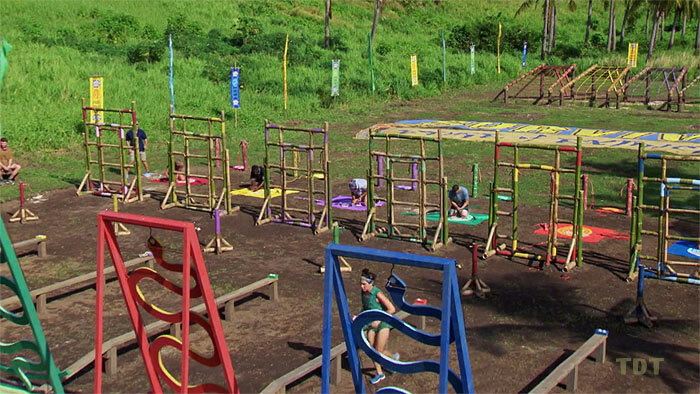 Contestants must stand in a squat position until the bars over their shoulders go either too high or drop too low. Lauren, Victoria, Kelley, Ron opt to sit out and eat pizza and drink beer, instead of competing. 6. Wardog, 5. Gavin, 4. Julie, in under 10 minutes. [19 min.] 3. Rick, [22 min.] 2. David, 1. Aurora wins. Ep10 F10 IC: "Squatty Probst" - Aurora wins. TC10 - David voted out (8-2), sent to EoE, 9 left. Ep10: "Blood of a Blindside" Ep11: "Fasten Your Seatbelts" Ep12: "Awkward"
Early on morning 26 (David's first day on Edge of Extinction), the contestants receive clues in bottles. David immediately searches the rocks and finds the advantage: An advantage in the next IC, that he must send in to the game. 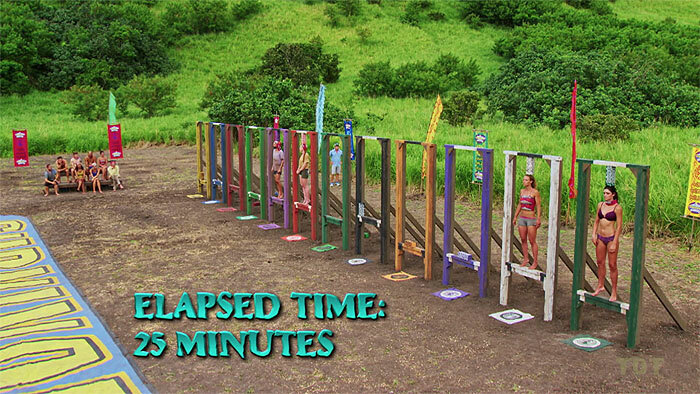 (Apparently also, unshown, a chance to practice the return challenge, as Aubry had days earlier.) He selects Rick to receive the advantage. David finds IC advantage, sends it to Rick. As originally seen in Philippines. 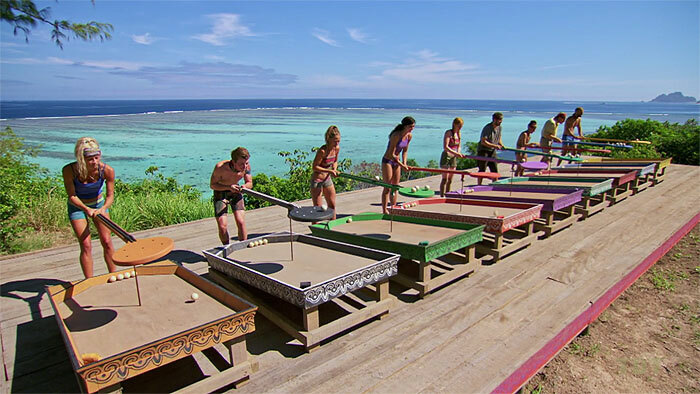 Contestants must roll five balls out on a paddle, and collect them in dimples on the paddle's blade. First to five balls placed wins immunity. Rick uses his challenge advantage from David, and only has to land four balls. Aurora, Rick, Ron soon have three balls placed. Nobody else is even working on their second ball. After several tries, Rick wins! Ep10 F9 IC: "Paddle Out" - Rick wins. TC11 - Kelley voted out (5-4), sent to EoE, 8 left. 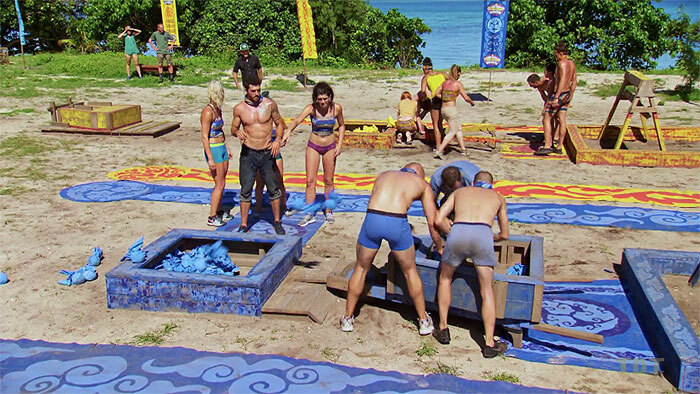 Ep11 RC: "Dressed to Keel" - Blue team wins. Ep11 IC: "Star Man" - Rick wins. TC13 - ? voted out, sent to EoE, 6 left. Ep13 F6 IC: "" - ? wins. TC14 - ? voted out, sent to EoE, 5 left. Ep13 F5 IC: "" - ? wins. TC15 - ? voted out, sent to EoE, 4 left. Ep14 RC: "" - ? wins, returns to game, 5 left.